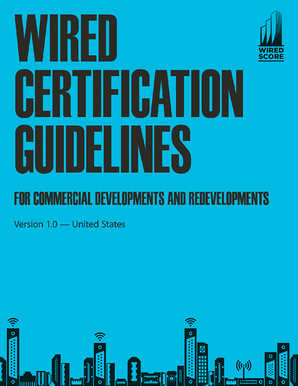 The Wired Certification Guidelines for Commercial Developments and Redevelopments is a handbook for engineers, architects, developers, general contractors, and construction project managers to ensure that any new commercial development or redevelopment is designed to meet the technology needs and expectations of all future tenants by meeting Wired Certification standards. High-speed connectivity in office buildings is no longer an amenity - it is a necessity widely considered to be the ‘fifth-utility.’ Internet is now a vital part of the office tenant experience and without it, businesses cannot function. However, there are many technical standards, guidelines, and industry best practices to consider when working on a commercial development or redevelopment project. Deciphering the most important elements to incorporate into a design can be a daunting task but we are working to simplify the connectivity design process. Wired Certification Guidelines will enable you to plan for resilient connectivity, redundant infrastructure, and future-proofed design, the three most important considerations for providing best-in-class Internet to tenants. "Wired Certification has enabled developers and landlords to easily and effectively articulate their properties’ information technology readiness to potential tenants who are tech savvy. At AKF, we are experienced designers and engineers of sophisticated building information technology infrastructure and we often speak a language which confuses people. Wired Certification has developed an industry accepted metric which safeguards a prospective tenant’s investment in their future. We welcome WireScore’s perspective on delivering value to our industry." We have developed these criteria based on our evaluation of over 900 commercial office buildings across the United States and United Kingdom, while also referencing best practices developed by industry experts. These guidelines are not intended to compete with or replace the existing standards bodies or local building codes that are referenced throughout. They are intended to complement those existing standards while focusing on the connectivity features that are most important to today’s tenants. The Wired Certified Guidelines for Commercial Developments and Redevelopments were developed with input from the WiredScore Connectivity Advisory Committee, a diverse group of thought leaders in CRE, technology, and telecommunications industries. With membership from industry leaders including Google Fiber, WSP/Parsons Brinckerhoff, Zayo, Arup, and Rudin Management. Join our email list for exclusive news, expert advice, event discount codes and more.